© the Artist. Photograph by Tim Thayer. Korean-born painter Moon-Joo Lee relocated to the United States to study at Cranbrook Academy of Art, where she began to document the ubiquitous construction sites skirting Detroit and similar cities across the country. The transitory urban fabric became her compelling subject, emblematic of fluctuating socio-economic conditions and a widespread culture of uncertainty. 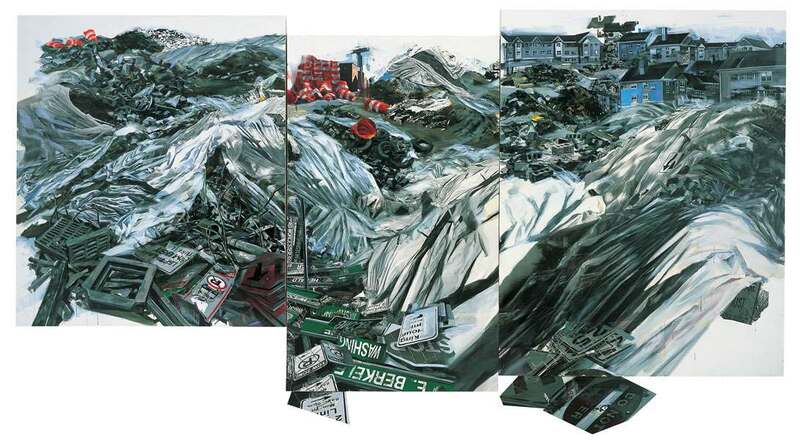 Lee’s mixed media painting Landscape of Residue dramatically portrays the cycle of sprawl, decay and reconstruction that perpetually transforms the American environment. In this composite image, a prefab housing complex sprouts in the distance above a mountainous terrain of cast-off street signs, tires, traffic pylons and assorted industrial refuse. Lee implicates us in the dereliction that we too often ignore, fixing our viewpoint from within the valleys of debris, the instability of which is reinforced by the fractured arrangement of adjoining canvases. By invoking the panoramic vistas of nineteenth-century painters such as Frederic Church and Thomas Moran, Lee’s contemporary landscape underscores the extent to which nature has been supplanted by a manufactured environment, portraying rampant cultural transformation as a modern expression of manifest destiny.